The Snipers - The Chip's Challenge Wiki - The Chip's Challenge Database that anyone can edit! Use cover on both sides to avoid being sniped. The Snipers is the 148th level in Chip's Challenge Level Pack 1. It is one of the Secret levels in CCLP1. It was created by Tom Patten. The safest route through the first portion of the level is to alternate back and forth, collecting chips as you progress downward. 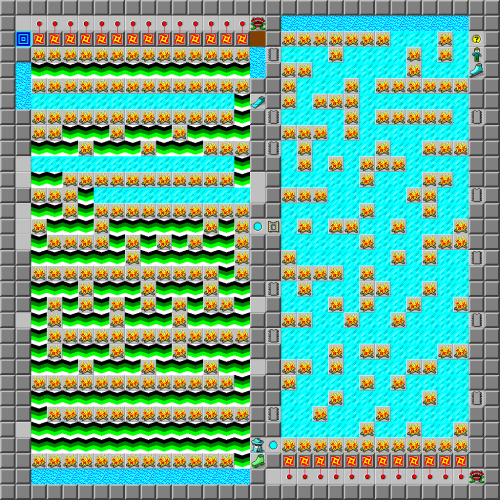 Skilled players may be able to collect multiple chips from the same side of the level at once. Move quickly when you are in the bottom portion of the level, as the fireballs clone quickly and give you very little room for error. Once you have collected 11 chips, exit the area through the teleport on the left side at approximately the center of the level. In the second half of the level, simply pick up the suction boots and dash across the force floors while dodging fire and cloned fireballs. Hide out in the alcoves on each side to avoid being hit by fireballs. Toward the end of the level, pick up the flippers and continue toward the exit. When you reach the top of the level, quickly clear the dirt so the teeth drown in the water then exit the level. This page was last edited on 26 February 2019, at 04:38.